Liz Moore during a recent visit to Egypt. 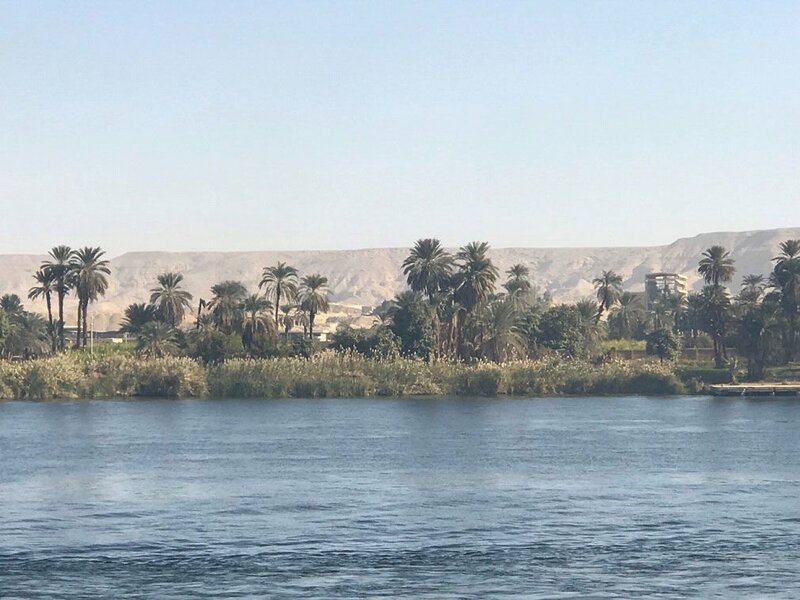 Along the banks of the Nile River. Our recent journey to Egypt put us in Cairo during the Coptic Christian New Year celebration. It was as an emotionally stirring time. A large bustling city in the North, Cairo was on high alert with armed guards and military tanks positioned throughout the city. The military presence was certainly not unwarranted. While we were there, a Coptic Christian church and a tour bus were bombed. 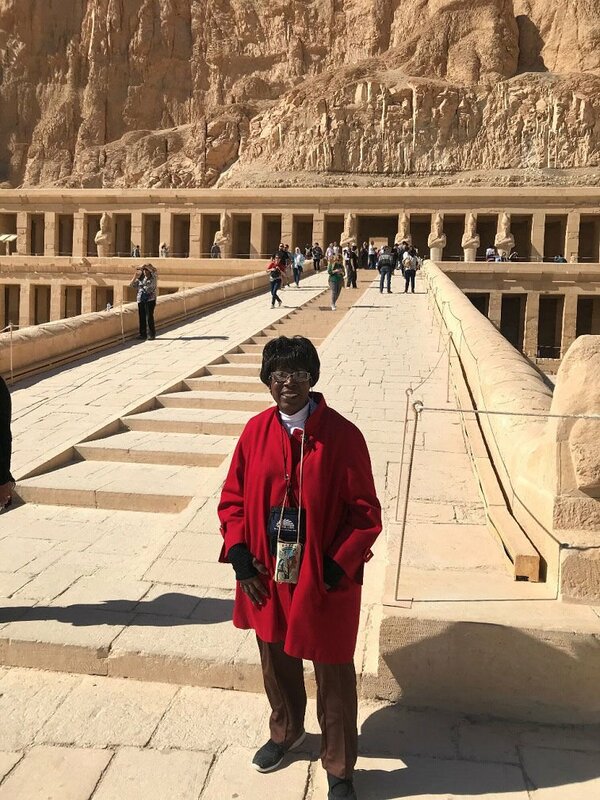 However, realizing that my mom, retired social worker and community leader, Elizabeth Moore and I were at the bank of the Nile River, gazing out to the Great Pyramids while standing in the cradle of civilization was unbelievable. Here we were in the country where Art, Science, Language, Mathematics and Engineering began. Think about it... people still don’t know how the Pyramids were built. I marveled at the mystery and majesty while standing next to a stone that is taller than a 6 foot man and almost a large as house…. How did they do it without modern day technology? Seeing this up close and personal made this secret knowledge even more surreal and mystical. To see the tombs with original words and artwork, and colorful display which the Egyptians created by developing brilliant dyes for paints, tapestries, and other creative work was incredible to see because this artwork has stood the test of time and lasted for thousands of years. To learn about the hosts of gods they worshipped, and about the purpose and process of mummification to prepare one for the after-life was fascinating as well as. Seeing what remained in the excavated tombs and museums made you think about how much was stolen or lost. Egypt is divided into upper and lower portions with a complicated history of dynasties that reigned from 5000-3200 B.C. before being besieged with conquerors ranging from the Greeks and Romans to the present day Arabs. We were fascinated by this history, curious to learn who the original Egyptians were and what they looked like. There appeared to be very few Nubians or what I refer to as African Egyptians in Cairo. The present day Egyptians have Arab features. But as we moved further south towards Aswan, we began to see darker skin people that looked like us. We were able to travel to an area where Nubians lived. Unfortunately, the darker the people, it seemed, the poorer they were, and often, the shoddier the area in which they lived. As with many places we’ve traveled the history of Africans seems to be purposely erased. It was the same in Brazil. Although, in Brazil the African story has become of interest to tourists so they are reclaiming that portion of their history and are now including examining the slave trade in their history as a tourist attraction. In the end, the Egyptians were a lovely and gracious people. The food consisted of delicious Mediterranean cuisine and the experience of moving through the desert of Cairo, to the green valley of the Nile, and the beaches of Alexandria was exhilarating and certainly a once in a lifetime experience!